It'll Feel Better When it Quits Hurting: Wear Your Seatbelt! David and a friend (who was driving) were in an accident last night. 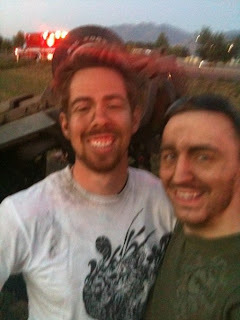 His friends jeep managed a triple rollover on a freeway on ramp. Both are fine - the jeep is a bit worse for wear. I almost didn't recognize David in this picture he took (he's the one on the right). Evidently a lot of dirt was involved. Thank goodness David was wearing his seat belt, and that the jeep has a roll bar. His friend wasn't wearing a seat belt - he was thrown and miraculously escaped serious injury. This isn't making me feel any more ease of mind about Alex driving. When my sister was in a terrible accident they combed out her hair as she lay on the gurney and there was a huge pile of dust and rocks when they were done. She was the only one wearing a seatbelt. Glad David is Ok.
Hopefully they both learned something. Like wear your seatbelt and drive careful. Your lucky to be alive and in one piece. I like to think the grin on their faces is shock. When do we get to stop worrying about them?